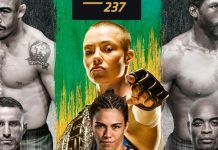 A key women’s strawweight fight between Michelle Waterson and Rose Namajunas served as the co-main event of tonight’s UFC on FOX 24 fight card in Kansas City. 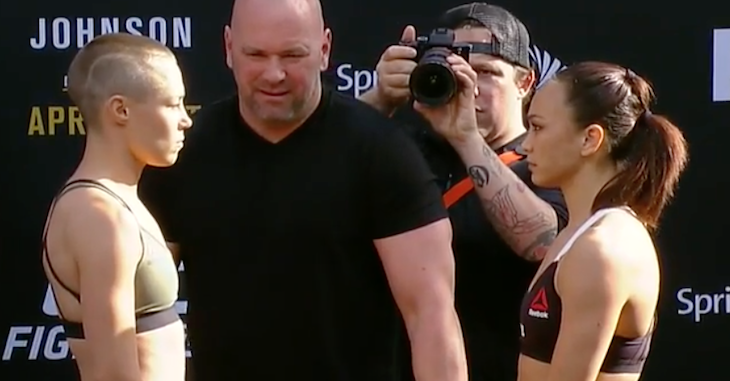 Rose Namajunas starts off quickly but misses with an early combination. Waterson lands a nice side kick and then scores an early takedown. Rose rolls and begins an attempt to the back of Waterson. She does! She locks in both hooks and then begins looking for a rear-naked choke. She tries to switch to full mount but Waterson scrambles back to full guard during the transition. Rose is able to posture up and then rains down a huge elbow on Michelle. Waterson uses an armbar attempt to scramble back to her feet. Michelle lands a nice push kick and then another. She comes forward with a left but Rose counters her with a hard right hand. Namajunas scores a takedowon but it is Waterson who lands a pair of strikes from the bottom before the horn sounds to end round one. Round two begins and Michelle is throwing some creative kicks to start. She just misses with a high kick. Rose presses forward but eats a side kick to the body. Namajunas lands a hard low kick. She follows that up with a high kick that absolutely floors Waterson. Michelle is still there but Rose is raining down some hard ground and pound now. 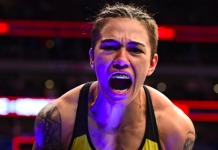 Waterson is able to get back to her feet but Rose jumps on her back and sinks in the rear-naked choke. Michelle is forced to tap. This one is all over!